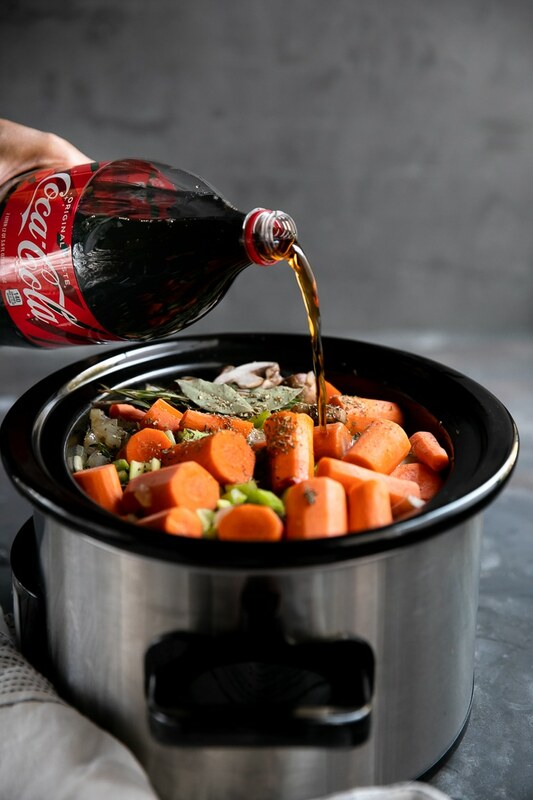 This Slow Cooker Pot Roast Recipe has been sponsored by The Coca-Cola Company. All thoughts and opinions are my own. 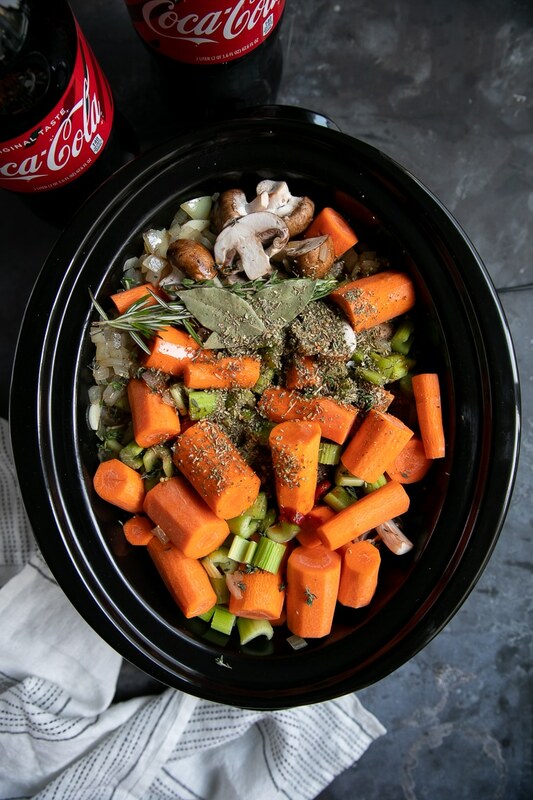 Bathed in tenderizing Coca-Cola®, this Slow Cooker Pot Roast Recipe is slow cooked with chunks of carrots, celery, mushrooms, and potato. The result is the perfect holiday supper filled with the most tender, juicy chunks of meat and a finger-licking, no-fuss gravy. 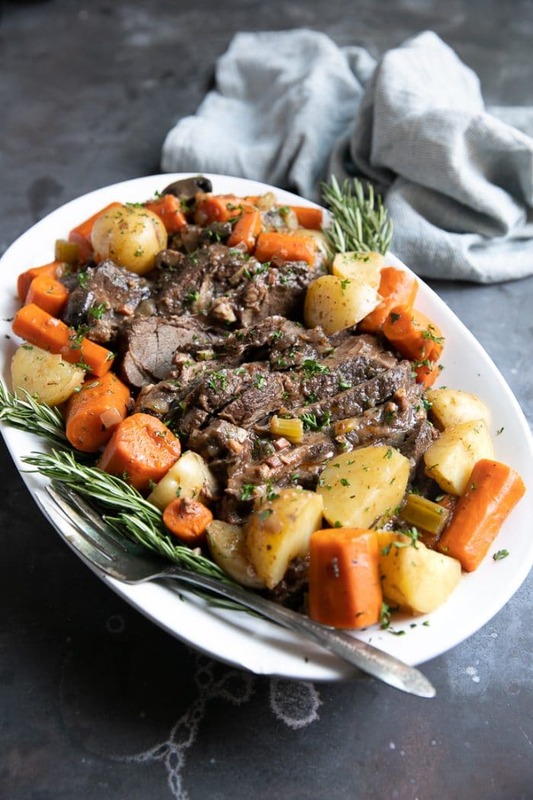 Celebrate the holiday season and the cold winter months with a big pot of this delicious and easy Slow Cooker Pot Roast. 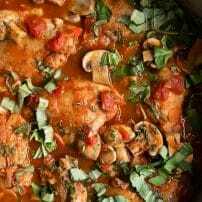 Slowly cooked in sweet and bubbly Coca-Cola® sauce with fresh herbs, the result is juicy meat; tender vegetables; and happy, well-fed family and friends. This holiday season, I’m doing all my shopping at Sam’s Club. It’s my one-stop shop for everything I need to cook, bake, and entertain. 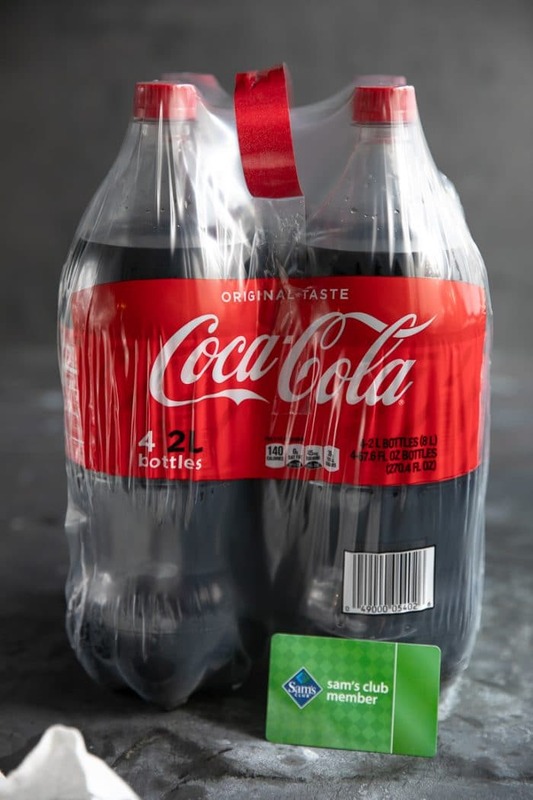 Sam’s Club always has everything I need in a well-planned floor plan (aka no crazy running around trying to find what I need), like Coca-Cola® in 2L bottles (4 pk.) which I always stock up on anytime my family visits. And, with Club Pick Up, I can order online and have everything I need ready to go when I arrive. 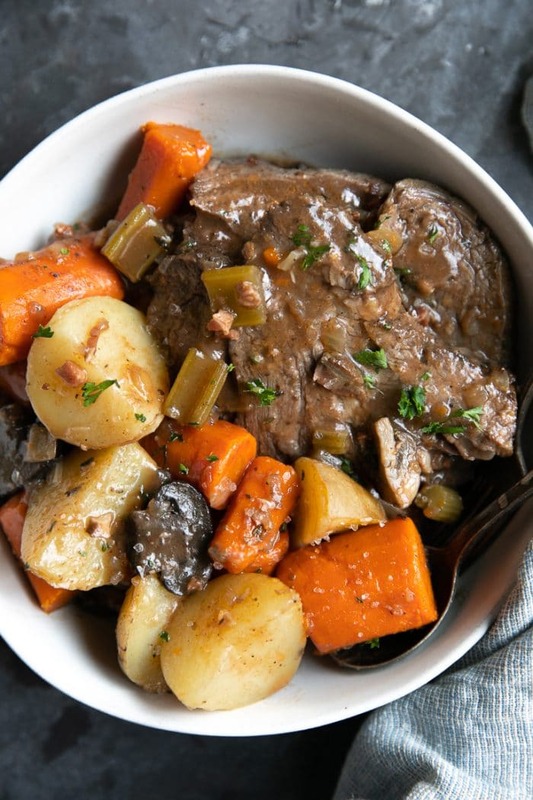 The pot roast is a braised beef dish made by browning a roast-sized (approximately 4-5 pounds) piece of beef before slowly cooking it in a covered dish. 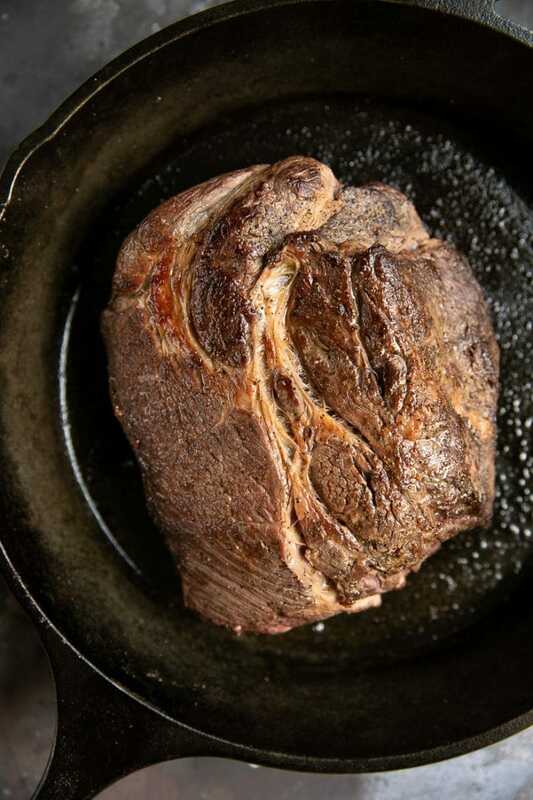 Typically, pot roasts will call for the tougher cuts of meat such as chuck steak, boneless chuck steak, and short ribs. These tougher cuts make them unsuitable for oven roasting, but slow cooking tenderizes the toughness of the fibers. The end result is tender meat with a rich, comforting liquid that’s perfect as a gravy. 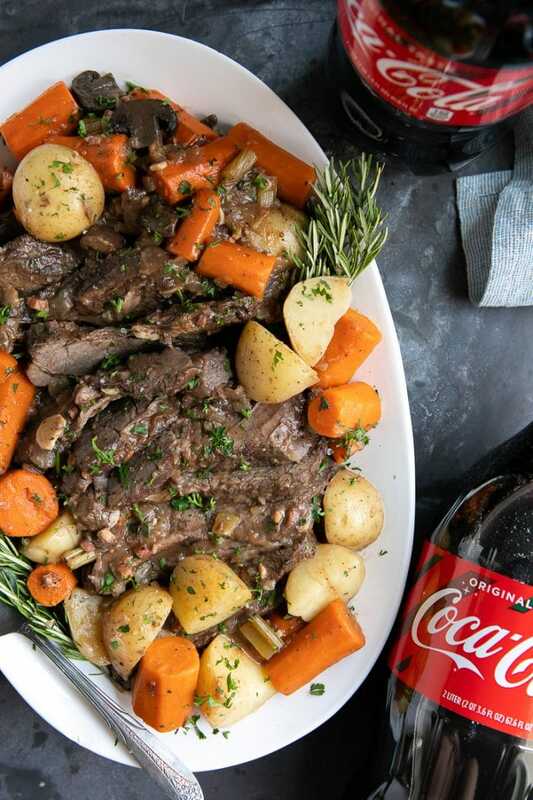 Why add Coca-Cola® to this Slow Cooker Pot Roast? I know, some of you may be thinking this makes zero sense. But it does, trust me. Here’s the thing, adding Coca-Cola® to the pot roast not only helps tenderize the meat as it cooks (no, it will not dissolve the meat) but also adds the perfect amount of sweet, caramelized flavor to the gravy. It will not taste like ice-cold Coca-Cola®. The Coca-Cola® adds flavor, but it does not dominate the entire dish. Do not use any kind of “diet” Coca-Cola®. You want the sugars. Season the chuck roast. Season all sides of your chuck roast with a generous pinch of salt and pepper. If you’re sensitive to salt, feel free to skip the salt and just add pepper. Brown the roast. Add the olive oil and butter to large skillet over medium-high heat. Once hot, add the roast to the skillet and brown for approximately 4-5 minutes on each side. As with most extra steps, this is not a required part of this recipe. However, for best flavor results, don’t skip this bit. It helps give a beautiful caramelized flavor that you want. Trust me. Prepare the vegetables. As the chuck roast is browning, prepare the onions, celery, carrots, potatoes, mushrooms, and garlic and transfer to the slow cooker. Mix well to combine. This is approximately how many vegetables you’ll add. All vegetables vary in size, so make adjustments as needed if your slow cooker gets too full. Transfer the beef and cook the pancetta. Once all sides of the chuck roast have been browned, transfer the roast to the slow cooker and wedge between the vegetables. Return the skillet to medium heat and add the pancetta to the skillet. Cook the pancetta for 3-4 minutes, or until fully cooked. * Transfer the pancetta to the slow cooker. Add the spices and broth. To the slow cooker, add the salt, pepper, rosemary, thyme, Worcestershire sauce, Coca-Cola, beef broth, and bay leaf. Cook. Cover and cook on low for 8-10 hours or on high for at least 5-6 hours. Thicken. One hour before serving, mix the cornstarch with the water in a small bowl. Add the cornstarch mixture to the slow cooker and gently mix to combine. 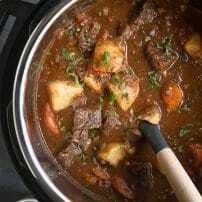 Alternatively, just before serving, you may remove the chuck roast and vegetables from the pot to a large serving plate and transfer the liquid to a small pot over medium heat. Add the cornstarch-water mixture and cook until thickened, approximately 2-3 minutes. Serve. Serve the meat with vegetables and gravy, and garnish with fresh parsley if desired. Brown the meat. After all, it’s part of what makes this pot roast a…pot roast. Cooking slow and low is best. 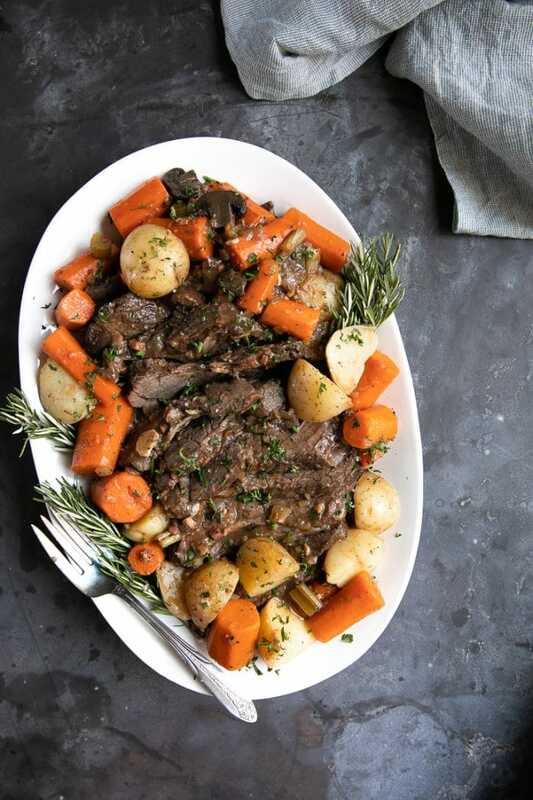 Of course, there is nothing wrong with cooking this pot roast on high for a shorter period of time, but patience is key to really tenderize the meat and break down those fibers. Save time and prep the vegetables ahead of time! Speaking of vegetables, I really love vegetables. Which is why I always add as many carrots as possible whenever I make any kind of stew. If you feel that the potatoes are taking up too much room, boil them separately and add extra carrots and mushrooms to the slow cooker. If you are sensitive to salt, start with less. As a whole, I don’t think that I added too much salt to this dish, but I know many of you may disagree. So, if you’re not a huge fan of the stuff, start with less. Don’t feel like you have to add pancetta. It definitely isn’t traditional to pot roast. However, I thought it would be a delicious addition. Truth be told—after cooking for so long, I could hardly remember it was there! Make extra for leftovers! Pot Roast sandwiches, anyone? Most of all, have fun with this recipe! Add what you love and skip the rest. Just don’t forget the Coca Cola®! 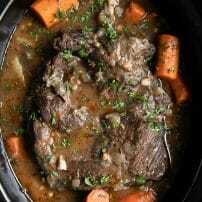 If you try making this Slow Cooker Pot Roast Recipe, please leave me a comment and let me know how it turned out! I always love to hear your thoughts. DON’T FORGET TO PIN AND SHARE THIS SLOW COOKER POT ROAST FOR AN EASY AND FLAVORFUL DINNER OR HOLIDAY SUPPER. 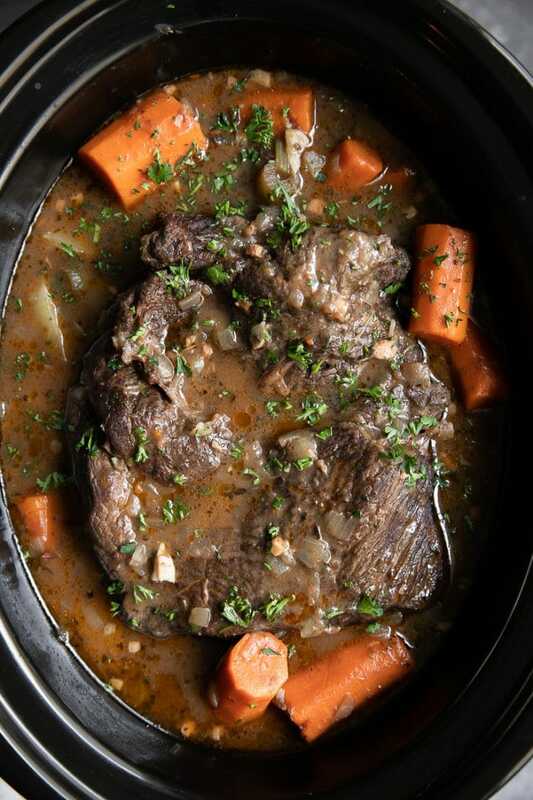 Bathed in tenderizing Coca-Cola, this Slow Cooker Pot Roast Recipe, is slow cooked in your slow cooker with chunks of carrots, celery, mushrooms, and potato. Season the chuck roast. Season all sides of your chuck roast with a generous pinch of salt and pepper. Brown the chuck roast. Add the olive oil and butter to large skillet over medium-high heat. Once hot add the roast to the skillet and brown for approximately 4-5 minutes on each side. Prepare the vegetables. As the chuck roast is browning, prepare the onions, celery, carrots, potatoes, mushrooms, and garlic and transfer to the slow cooker. Mix well to combine. Transfer the beef and cook the pancetta. Once all sides of the chuck roast have browned, transfer the roast to the slow cooker and wedge between the vegetables. Return the skillet to medium heat and add the pancetta to the skillet. Cook the pancetta for 3-4 minutes, or until fully cooked. * Transfer the pancetta to the slow cooker. Add the spices and broth. To the slow cooker add the salt, pepper, rosemary, thyme, Worcestershire sauce, Coca-Cola, beef broth, and bay leaf. Thicken. One hour before serving mix the cornstarch with the water in a small bowl. Add the cornstarch mixture to the slow cooker and gently mix to combine. 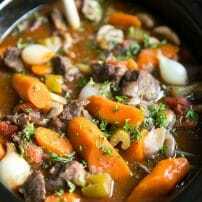 Alternatively, just before serving, you may remove the chuck roast and vegetables from the pot to a large serving plate and transfer the liquid to a small pot over medium heat. Add the cornstarch-water mixture and cook until thickened, approximately 2-3 minutes. Serve. Serve the meat with vegetables and gravy and garnished with fresh parsley, if desired. If you love vegetables like carrots and celery, I recommend boiling the potatoes separately to make more room for vegetables such as this. The potatoes can easily be added back to the crockpot after the meat is fully cooked. If you can't find pancetta, substitute with 1/2 pound of bacon. Or, skip the pancetta altogether. Click here to find a Sam’s Club near you!